Season the short ribs liberally with salt and pepper. Place the ribs in a large container to marinate overnight. Cover with the herbs and pour the red wine over all. Marinate for at least 12 hours. Remove the ribs, reserving the marinade. In a large cast iron or heavy-bottomed skillet add enough extra virgin olive oil to equal 1/4 inch. Sear the ribs on high heat until dark brown on all sides. Remove the ribs when good and dark and place in a brazier or hotel pan. Top with the herbs used in marinating. Pour the red wine into a saucepot. Bring the wine to a simmer slowly and skim off any impurities; reduce to half the original volume. In the same pan as the ribs sauté off the mirepoix veggies and the porcini until brown. Pour the wine over the veggies and bring up to a simmer. Add ribs and top with bay leaves, thyme sprigs and rosemary. Top with veal stock just to cover, bring up to a simmer and place in a 375-degree oven for 4 hours, covered with parchment and foil. When ribs are tender, allow 30 minutes for them to cool, and then remove from braising liquid. Strain the liquid into a stainless steel saucepot and reduce very slowly, skimming the fat and impurities until one-quarter of the original liquid is left. Place the ribs back in the sauce and simmer covered until they are nicely glazed with the sauce. 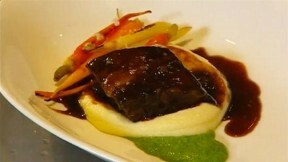 Serve ribs with Parsley Pistou, baby carrots that have been blanched and sautéed in butter and potato puree. Use Yukon Gold potatoes, boiled in their skins, peeled and passed through a food mill, then a fine strainer. Blend with cream and butter.